Secret: until this year I didn’t love candy corn. Now I wonder where it’s been all my life. It’s especially good when you mix it with peanuts. And now? 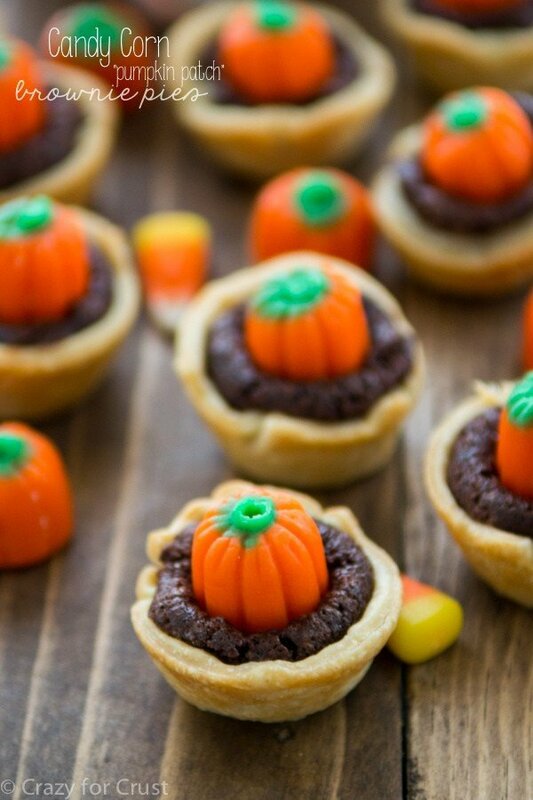 Candy corn is amazing when you pop in on top of mini brownie pies. Use pumpkin candy corn and you’ve got yourself a pumpkin patch, perfect for Halloween or Thanksgiving! It’s no secret that I love a brownie pie. I’ve made footballs, mint, turtle and coconut. I’ve even turned brownies and pie into a Snickers and my favorite recipe in my book is a brownie pie made with Milky Way candy bars. Last week I told you about the candy corn shortage at my local Walmart. (I know, right?) When I went to my second store to stock up I bought lots and lots of candy corn. Then I had to hide it from Jordan because when it comes to candy corn, she’s totally addicted. I say that as I’m remembering the M&M incident of ’13. When she kept saying she was just getting a few M&Ms and like a stupid person I trusted her. She ate the entire bag in a week. Moral of the story: you can’t trust Jordan around candy. Anyway, during my stock-the-candy-corn-for-armageddon shopping trip, I bought some Candy Corn Pumpkins. I’m sorry, but they’re the cutest things ever since these. Anyway, my first thought – seriously – when I saw them was that I needed to make brownie pies. These pies could not be easier to make. All of my brownie pies are absurdly easy. I start with a refrigerated pie crust. Pillsbury is my favorite and I’m saying that because I believe it, not because I also work for them. You can also use a homemade pie crust for these, but in this instance, the Pillsbury just makes it easier. Use what you like the most! Normally I use a boxed brownie mix for my mini pies, but this time I decided to give my homemade brownie mix a whirl. 2 cups of that mix, plus the ingredients, filled about 36 pies which is perfect for 2 pie crusts. If you prefer to use a box you can. A 9×13 pan sized box of brownie mix will yield you 36 pies with some batter left over. I like to pour the leftover batter into muffin pans or a mini loaf pan. My homemade brownie mix baked in the pies in about 13 minutes. If you’re using boxed brownie mix, they can take up to 15 minutes, depending on the brand. If you only want to make 18 pies, use one pie crust and follow the 1 cup recipe for the homemade brownie mix (or, if using a box, you’ll just have some more batter left over). Once the pies are baked and come out of the oven, immediately push a candy corn pumpkin (or regular candy corn) on the top. If you wait too long, the brownie will cool and it’ll be hard to push the candy corn in. Let them cool, then eat! 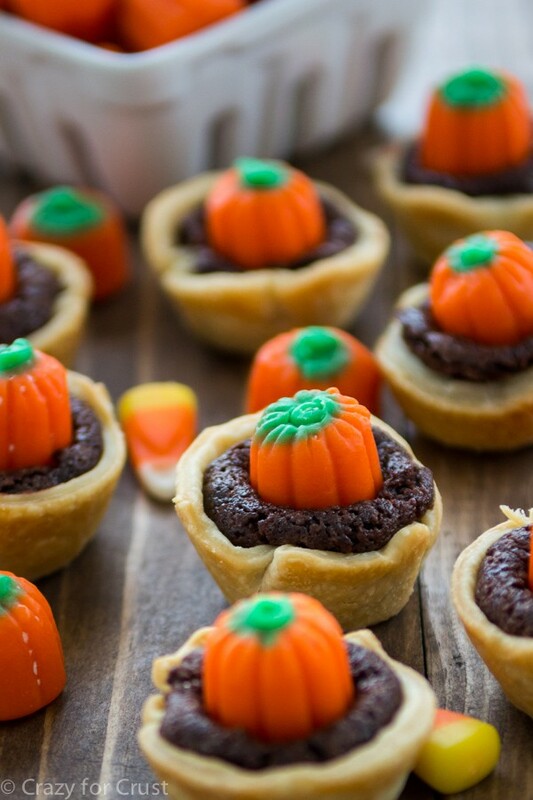 It’s like an edible pumpkin patch! These brownie pies are easy to make with homemade or boxed brownies. 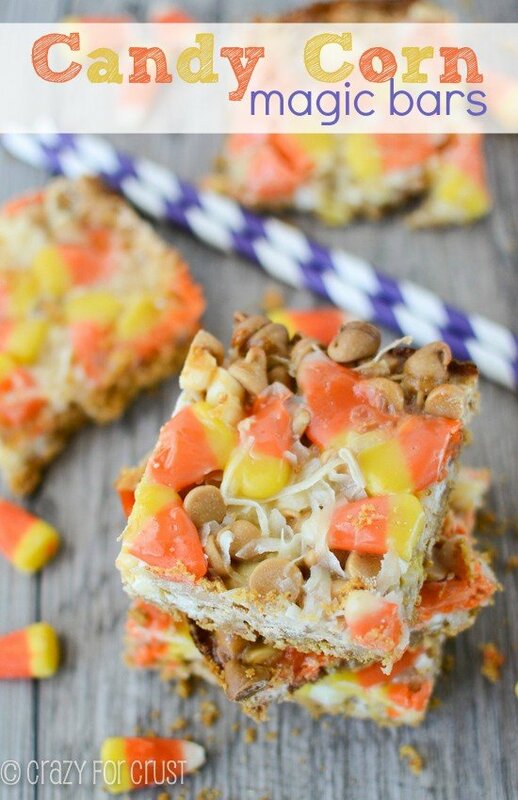 Top them with candy corn pumpkins for a fun Halloween treat! Preheat oven to 350°F. Unroll one pie crust and use a 2 1/2” round cookie cutter to cut circles of dough, re-rolling as needed. Spray mini muffin tins with cooking spray (I like to use the kind with flour in it) and press one round in each cavity. Repeat with second crust in box. You will get about 36. Chill until ready to fill. Bake pies for about 12-14 minutes, until the crust is browned. Remove from the oven and immediately place a Candy Corn Pumpkin (or some regular Candy Corn) on top. Let cool before removing from the pans. 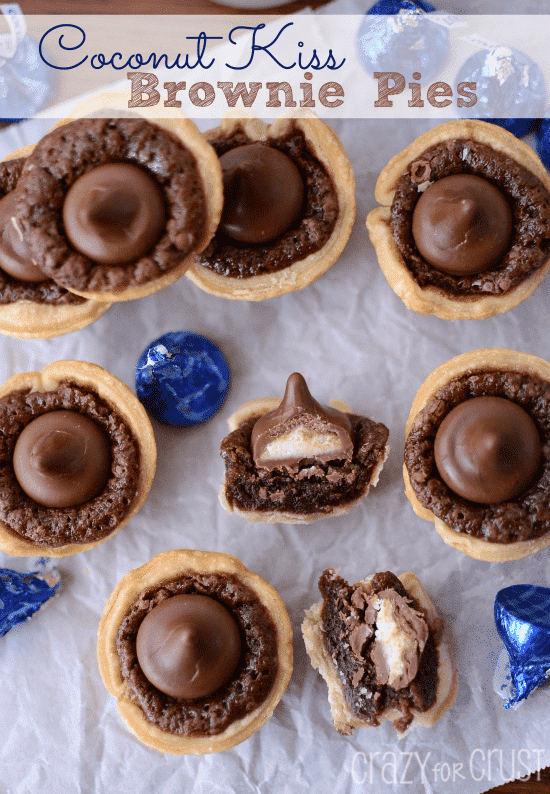 Coconut Kiss Brownie Pies – use your favorite Hershey Kiss! I thought I remembered something about Jordan and candy, so I was really hoping you wouldn’t kill me when I gave her some over the summer! 😉 These are way too cute, just like your football version!! An edible pumpkin patch! I love it! 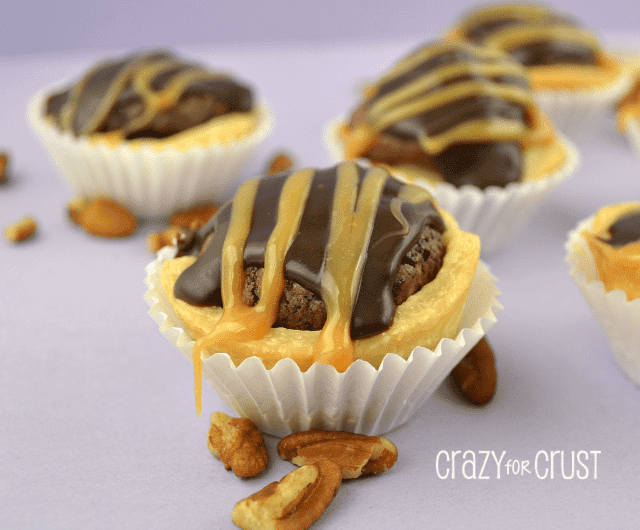 Would make a great treat for little kindergarteners! Yeah, me neither. Why I thought she could is anyone’s guess! Super cute! I can’t wait to try the recipe. So cute! I love those pumpkin candies, will look out for them in the grocery store next time! Pinned! Oh my gosh, I LOVE candy corn! I fell in love with these when I saw you post them on instagram…festive, pretty, and I’m certain yummy. 🙂 Sounds like a winner to me! Have a lovely weekend! Which size batch of your brownies do you use to make this recipe? I plan on making them and bringing them to my work party on Friday! Just made these.. I had to use a normal size muffin pan which was not a problem at all, although I would have preferred mini. 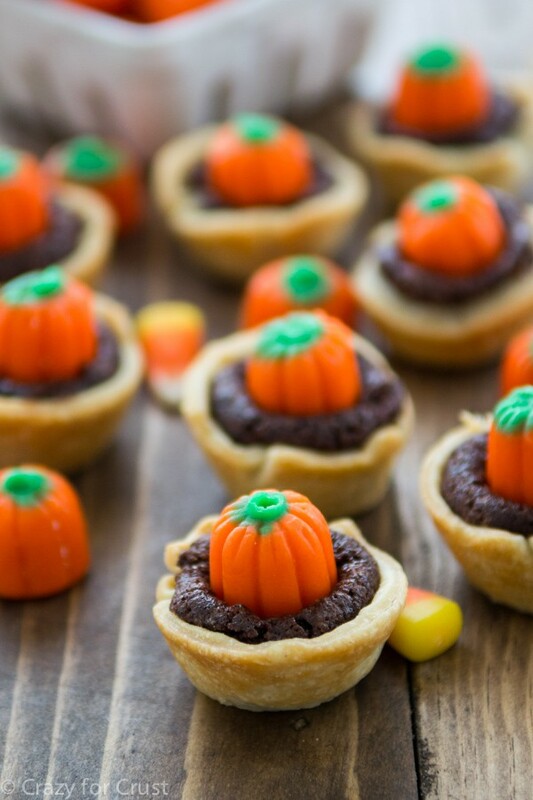 They came out great and I loved the combination of the candy corn pumpkin and the brownie! I’m so glad you like them, and good to know they work in a regular muffin pan! 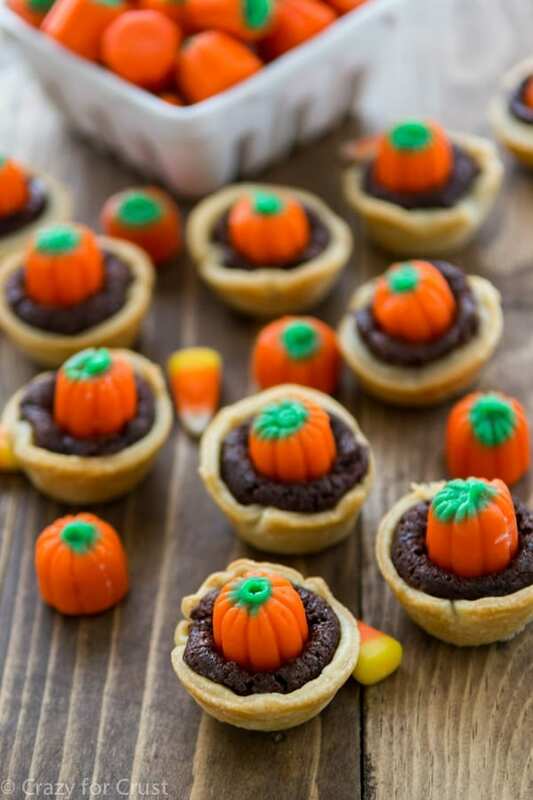 Love love love the pumpkin brownie pies…mine are in the oven baking can’t wait till they finish…..they smell so good….I love baking in the fall it makes the house smell so good…..
Making these for my grandson Halloween party…. too cute !!! Will have to make extras for the the rest of the crew..